Some stakeholders in the country’s port sector have backed the decision by West Blue Ghana Limited, an IT solutions firm, to seek redress at the court for the alleged plagiarisation of the national single window software by Ghana Link and three others. According to them, the decision of West Blue to allow the court to determine the software system controversy was the right path to take to settle the issue once and for all. Responding to the announcement that West Blue had dragged Ghana Link Network Service Limited and its partners to court for an alleged cloning of its single window software, the Ghana Institute of Freight Forwarders (GIFF) said allowing the court to settle the case would go a long way to put the matter to rest so that businesses could continue their work without having to worry about the issue, which had the potential to affect their operations. “When we heard that West Blue has taken the matter of the software system possible piracy to court, we felt it was the right thing to do than just using any other means to address the current challenges,” President of GIFF, Mr Kwabena Ofosu-Appiah said. He said although GIFF had made known its stand regarding the issue, the institute was glad that the matter would finally be settled in court. “We had earlier kicked against the takeover of the single window operations at the port because we felt the system was no different from the current one being implemented by West Blue. We still stand on that point of view. However, we are a bit calmed that the issue is in the court now,” Mr Ofosu-Appiah said. He said the institute would closely follow the court case and would respect the judgement of the court once it’s given. 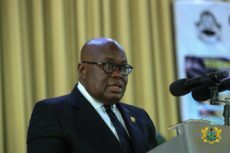 Other stakeholders in the port sector also urged President Nana Akufo-Addo to launch investigation into the matter to save the government from shame, stating that the controversy surrounding the UNIPASS deal is an embarrassment to government. The controversy surrounding the UNIPASS National Single Window took a different turn last week when West Blue Ghana Limited, operators of the system, dragged Ghana Link Network Service Limited and its partners to court for allegedly pirating its software for the project. West Blue is seeking an order from the court restraining the three companies, its directors, agents or anyone acting in their names from using its software as part of the UNI-PASS system. The suit comes barely two months after the Economic Management Team (EMT), headed by the Vice-President, Dr Mahamudu Bawumia, directed the suspension of the UNI-PASS port clearing system, which was scheduled to commence on January 1, 2019. The contract was to expire in 2020, after which West Blue would hand over the system to the Government of Ghana. Ghana Link, with its overseas partners, CUPIA Korea Customs Service, will provide the trade facilitation and Customs Management System at a 0.75 per cent fee (FOB) per their contract with the Ministry of Trade.